It doesn’t seem possible that it is May already. Judgment day is getting closer and closer. You still have time to work on entries for the needlework contests. These are open to all. You may submit one entry in one or all classes. Classes are as follows: A: Afghans, B: Doilies, C: Embroidery, D: Three Piece Baby Set, E: Plastic Canvas; F: Counted Cross Stitch; G: Adult Garment; H: Latch Hook; I: Quilted Wall Hanging; and J: Stuffed Toy. All first place entries will advance to the Eastern States Exposition to be judged at the Grange New England level. 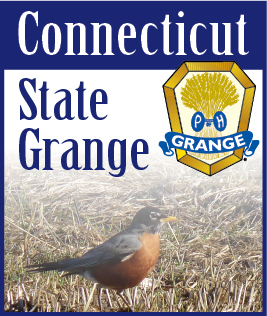 Winning entries will be displayed in the New England Grange Building until the end of the Big E. From there they go to the Connecticut State Grange Convention from October 15-17. Don’t forget our new members only contest, “Dress A Doll.” You may use a new or old doll, make clothes (sew, knit, crochet, etc.) and dress it. This contest will be judged only at “Let’s Celebrate Day,” and the doll will be returned to you. We have also added another craft category for those interested in Scrapbooking. You may enter a scrapbook of any size, any subject, and any design. The book will be returned to you. Only one book per person may be entered. This contest is for Grange members only. All judging for the CWA State Contests will be held on “Let’s Celebrate Day” on July 25, 2009 in Good Will Grange Hall in Glastonbury, CT. If you have yarn left over from your projects, we are still collecting “Comfy Covers” you could make with it. These are for children of all ages for Covenant to Care, Inc. They are to be brought to State Session. Also, we would like small good toys for infants to teenagers. Foster Families is always in need of Memory Books. Remember the New England Grange Building Country Store. Again in 2009 we will need handmade items to sell. We are not allowed to sell commercial items. Don’t forget your monetary donations for the State Projects before you slow down for the summer. They are: Connecticut Granger Trust Fund, Connecticut State Grange Student Loan Fund, Camp Berger Maintenance Fund, and Fund for Teenaged Foster Kids. Let us try to outdo ourselves with entries to all needlework, craft, and baking contests.